After completing these steps, we need to determine the interrupt type generated by EINT inputs: Normal Interrupt Request (IRQ) or Fast Interrupt Request (FIQ). After setting edge sensitive mode and polarity to become falling edge sensitive to interrupt signal. We have to modify PINSEL0 register to change the function of pin P0.15 from General Purpose IO i.e. 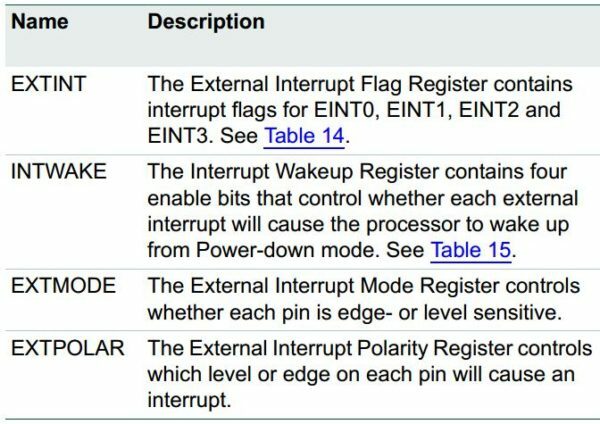 GPIO to External Interrupt 2 (EINT2). Now we must modify the vector control 5 register (VICVectCntl5). There are 16 of these registers (VICVectCntl0 to VICVectCntl15), each controlling a vector IRQ Slot. VICVectCntl0 has highest priority, while VICVectCntl15 has the lowest priority. Let’s modify VICVectCntl5; Bit fields 4:0 is for the number of the interrupt request. External Interrupt2 (EINT2) is channel 16. We want this interrupt channel to be assigned to IRQ Slot5. So we must modify register VICVectCntl5 to allow this we load bit fields 0:4 of VICVectCntl5 with “(1<<5) | 16” because we want channel 16 in this IRQ slot. Bit field of ‘5’ of VICVectCntl5 is for IRQ slot enabled i.e. (1<<5). When this bit field is 1, this vectored IRQ slot is enabled. (THIS IS NOT SAME AS ENABLING AN INTERRUPT), this is just to enable the vectored IRQ slot. Disabling a vectored IRQ slot in a VICVectCntlX register does not disable the interrupt: it just changes the interrupt from Vectored to Non-Vectored form. Now it’s time to modify the vector address register (VICVectAddr5). This register holds the address of the Interrupt Service Routine (ISR). This is where we tell the microcontroller the program function we want to execute when an external interrupt is triggered. Here we’ve named our external ISR “Ext_ISR”. The following line of code extracts the memory location of that function and stores it in VICVectAddr5. Finally, it’s time to enable the external interrupt. We will now modify the Interrupt Enable Register (VICIntEnable). This register controls which of the 32 interrupt requests and software interrupts contribute to FIQ or IRQ. 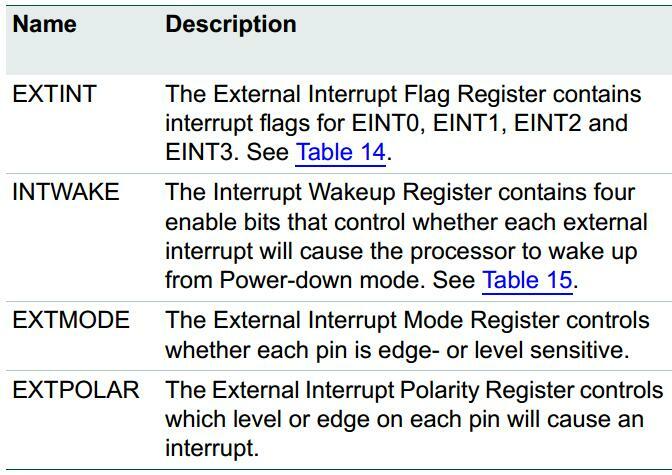 We only care about the external interrupt, which is bit field ‘16’ of this register. We set this bit high to enable external interrupt. The _irq keyword tells the compiler that the function is an interrupt routine. 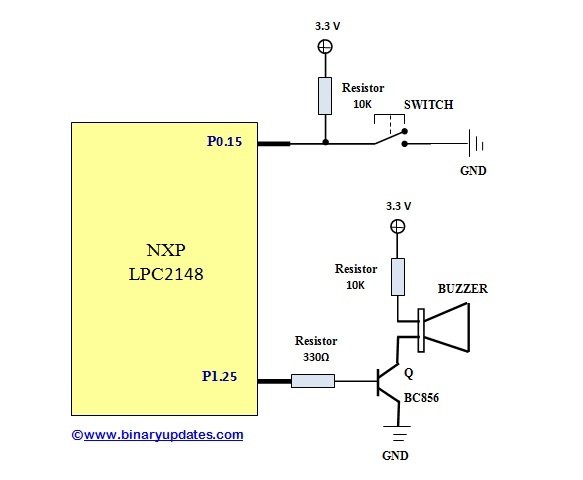 In this function, we’ve simply configure pin P1.25 into output mode and generated beep using buzzer. Finally we’ll have to clear interrupt by “EXTINT |= 0x4” and declare end of interrupt (VICVectAddr = 0x0). 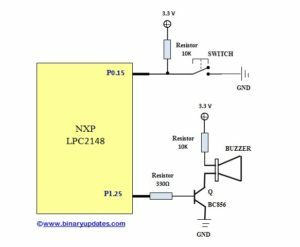 This is how we can use external interrupt in LPC2148 ARM7 Microcontroller to design sophisticated embedded application. We have not covered different types of level triggering configurations of external interrupt. Because it’s not in the scope of this tutorial. Maybe in our future post, we’ll see more projects where we’ll use different triggering methods in external interrupt. If you have any questions then leave a comment.